It's another week with investors asking themselves: When will the Federal Reserve begin tightening its easy money policies? U.S. stock futures were slightly lower early Monday as investors pondered that question. Tapering by the Fed was the focus of weekend discussions as central bankers from around the world took part in the Fed's annual monetary policy symposium in Wyoming. Emerging economies like India, Brazil and Indonesia are especially vulnerable to changes in Fed policy. The U.S. dollar is already rising versus foreign currencies like the Brazilian real and the Indian rupee, and some investors are pulling their money out of these countries, triggering fears of a panic. In economic news, the U.S. Census Bureau will release its monthly report on durable goods orders at 8:30 a.m. ET Monday. Shares of Amgen (AMGN) rose 4% after it agreed to buy Onyx Pharmaceuticals (ONXX) for $10.4 billion, in a deal that will give Amgen access to a wide range of cancer treatment drugs. U.S. stocks finished higher Friday. The Nasdaq ended the week up 1.5%, while the S&P 500 added 0.5%. 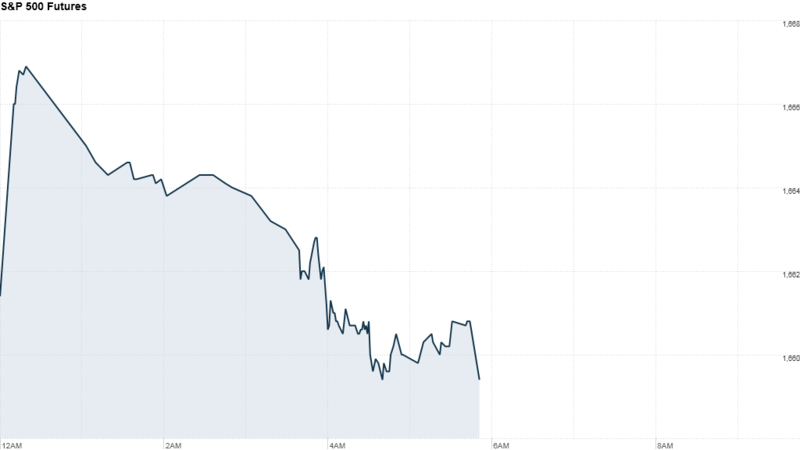 The Dow, despite moving slightly higher Friday, fell for the third straight week. European markets were lower in morning trading. The London Stock Exchange is closed for a holiday. Asian markets ended mixed after a relatively calm trading session, with the Shanghai Composite adding 1.9% and the Hang Seng increasing 0.7%. The Nikkei ended in negative territory.